“Millionaire’s Shot” is the latest contemporary romantic fiction novel by Bev Pettersen. Alex Sutherland and Cassie Edwards practically grew up together and have always shared a special relationship. When Alex suddenly marries another woman, Cassie’s world is shattered and she flees her grandfather’s small horse farm to start a new life away from the newlyweds. Years later, Cassie’s grandfather needs her help and she can’t stay away any longer. Cassie tries to convince herself that everything will be fine–Alex is just a friend after all, right? Things haven’t been easy for Alex all these years either, as he’s sacrificed everything to keep his daughter safe. Cassie’s return to town reignites the jealous wrath of Alex’s ex-wife, who threatens to destroy everything and everyone Alex holds dear. Bev Pettersen is an extremely gifted writer with the capacity to turn out a wonderful story, time after time. I know I am in for an incredible evening of entertainment whenever I pick up one of her books. She often reminds me of Danielle Steele, with the depth, charm, and grace of her storytelling ability. “Millionaire’s Shot” lives up to the standards I’ve set based on my experience with this author’s work. The characters are well developed and realistic, with two headstrong lovers, a wise old man, a vindictive ex-wife, and an innocent child caught in the middle of it all. It makes no difference if you love them or hate them, you will definitely feel passionately about each character. Whether the setting is in the barns or on the polo fields, at the country club or an old farmhouse, Pettersen’s knowledge and experience of everything relating to horses translates crystal clear on every page. 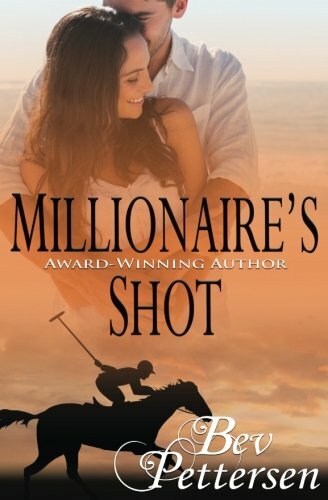 With just the right amount of romance, drama, horses, and suspense, “Millionaire’s Shot” by Bev Pettersen is sure to be another smash hit. If you haven’t read any of Pettersen’s novels, you are in for a treat. If you have, you already know what I’m talking about.